This quarterly monitoring, published by GRIP since 2011, aims to monitor the security situation in West Africa with a focus on Burkina Faso, Côte d’Ivoire, Guinea, Mali, Niger and Senegal. It examines in particular broad internal security issues, regional tensions, and cross-border and transnational crimes. Can we envision a Belgian industrial offer on the military drone market? The question is thornier than it seems. This Analysis first attempts to provide and discuss the keys to understand the structure of the supply of military UAVs on international markets. Then, it identifies the main drones producers paying particular attention to the United States and Israel's unique trajectory. It also looks at the characteristics of the European offer and the challenges ahead. Finally, it positions Belgium in this overview of the industrial offer of military UAVs. Read more about Can a Belgian offer exist on the military UAV markets? Read more about Cooperation between customs and export control authorities: a necessary common classification of goods? By accepting the European Defence Fund, the EU Member States could have reopened the thorny debate of arms export controls. The regulation around the Fund’s inner working will inevitably raise a question: if the Community budget of the EU is used to fund weapons systems, shouldn’t the EU have a say in case those weapons systems are exported to third countries? This Analysis seeks to expose the various links between political actors and non-state armed groups in Turkey. Historically, both political parties and State’s services have made use of violent groups to serve their interests through various patterns of collaboration. However, the risk of violent clashes erupting between ideological or political groups has heightened following the failed coup attempt in July 2016, due to the increasingly polarizing rhetoric promoted by the government and tearing apart the society. 24 March 2019 will mark the twentieth anniversary of the beginning of NATO's air strikes against the Federal Republic of Yugoslavia. The intervention, according to the official speech, was supposed to "prevent a humanitarian disaster" or "stop genocide" against the Albanian population in Kosovo. However, the situation worsened during the weeks of bombardments, which seems to have triggered rather than prevented the announced "humanitarian disaster". Twenty years later, how is the situation in the region shaping up? What is Kosovo's current status and place in regional and international relations, while relations with Belgrade, who does not recognize the independence of its southern province, seem to be at its lowest? What is the economic, political and social situation like? Finally, what are its prospects for the future, at a time when the EU is losing its attraction and influence in the Balkans? Photo credit: BalkanInsight - From right to left: Fatmir Limaj, Deputy vice-prime minister; Kadri Veseli, president of the Parliament; Ramush Haradinaj, Prime minister; and (to the right of Federica Mogherini) Hashim Thaçi, president of the Kosovo. The four current top leaders of Kosovo in this photo are also suspected of organ trafficking. 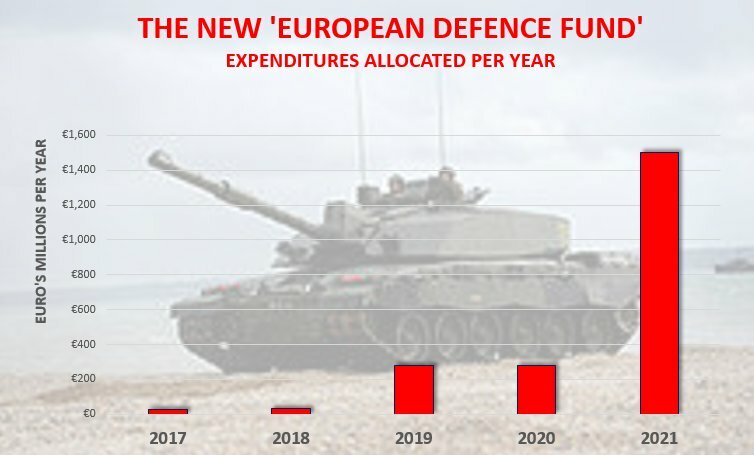 Since it first popped out of the Commission's hat, the European Defence Fund has been a constant source of concern. The questions it raises are many, and often take an ethical turn. The resulting answers are therefore rather clear-cut: they tend to be enthusiastic or disgusted, depending on opinions. They are rarely nuanced. This article aims to focus in particular on the matter of the relevance of the Fund as a EU competence. Is the process of integrating the Old Continent finally ready to extend to the defence sector, or are we in reality facing a cover-up that is intended to finance military industries and policies that will ultimately continue to operate on the basis of purely national logic? Will the Community budget be put at the service of the European ideal or of the "gun merchants"? An analysis of the Fund's governance system can help us understand. Panzerhaubitze 2000 howitzers and Buk anti-aircraft missiles, Kiowa Warrior and Mi-35 helicopters, F-16 and MiG-29 fighters, ... Croatia and Serbia's arms purchases seem to respond to each other, and some fear a repetition of the 1990s scenario, when the rivalry between the two Yugoslav republics led the Balkans into a bloody conflict. This note first explains the origin of the armed forces of both countries and their respective evolutions, then sets out various indicators (military expenditures, arms imports, manoeuvres, etc.) that can be used to assess their respective military strength. This suggests that while both countries are in the process of renewing their weapons, the level of rearmament remains rather modest at the European level. Above all, the absence of any real point of contention seems to rule out any risk of armed conflict in the short term. Read more about Croatia-Serbia: a mini-arms race in the Balkans? End-user/end-user certificates, and the post-export control mechanisms sometimes associated with them, are essential tools in the fight against arms diversion. Several European States have recently undertaken measures to implement such tools. However, there are significant disparities due to varying ambitions and resources from one State to another. This analysis examines different national initiatives on post-export controls in Europe. Particular attention is paid to the study of the verification systems put in place by Switzerland and Germany, pioneers in this field. The elections scheduled for December 30 in the Democratic Republic of the Congo were preceded by so many controversies and scepticisms, that their outcome look set to be unpredictable. In view of the upheavals that have reshaped the country's political landscape since the disputed elections in November 2011, this could be the most competitive election since the 2006-2007 election cycle. That is, if the conditions under which it is conducted allow for real transparency. Read more about Aude-E Fleurant : "2017 est la troisième année consécutive de croissance des ventes d’armes des firmes du Top 100"
Read more about Certificat d’utilisateur final : une valeur ajoutée ? Arms and military equipment production employs several thousand workers in the 71 companies identified in the GRIP database, but it also has effects on the employment of the Belgian economy as a whole. These effects are measured by different types of jobs multipliers defined by the Federal Planning Bureau for each sector of activity in Belgium. These multipliers make it possible to estimate the total employment that will be created in the whole of the Belgian economy (in the firms, in the suppliers chain and by the consumption of the households) when a company has to increase its production to respond to an additional exogenous final demand. According to this methodology, GRIP estimates the total employment generated in Belgium by the production of weapons and military equipment at 11,403 jobs in 2017. In recent years, numerous indicators, or indexes, have been developed by international and non-governmental organizations with the objective of assessing State’s performances on an increasingly wider array of issues. These indicators now represent a systematic and important source of information on political, security and human rights issues of one given country. This Note intends to analyze the use of indicators as risk assessment tools in the field of arms exports control. The aim is to contribute to improved practices while assessing risks associated with arms export and to the consolidation of the User Guide on the EU Common Position. The South China Sea is a strategic area of transit for a large share of global trade. It is also a region characterized by territorial and maritime disputes between China and several of its Southeast Asian neighbors. In July 2016, an arbitration tribunal ruled that Chinese claims were not consistent with the provisions of the United Nations Convention on the Law of the Sea (UNCLOS). However, this clarification of the rule of law did not facilitate negotiations between China and its neighbors. On the contrary, it led to a consolidation of a discussion format where power asymmetry and political games dominate. This note aims at detailing this apparent paradox, between an eroded rule of law and a falsely reinforced diplomatic channel. The standards and procedures of EU Member States to strengthen arms export controls, including preventing and countering diversion, are considered to be among the highest in the world. Yet today, not a month goes by without a Member State being questioned about its export decisions. The publication of cases of diversion - suspected or proven - of European weapons in the Middle East is increasing, and now from countries that are considered as allies and among the best customers of the EU countries. This Analysis presents some of the challenges in preventing and combating the diversion of weapons that EU Member States face when authorizing exports. When the regime of Muammar Gaddafi collapsed under NATO bombs, in 2011, France and the United Kingdom, the main instigators and actors of the Libyan campaign, were far from understanding that Libya would become the theater of a never-rending and complex conflict, much like those who torment the Middle East.